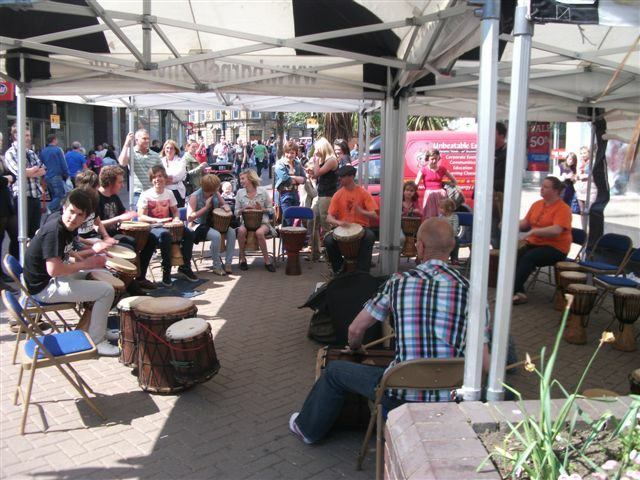 Following on from the success of the previous week at Cannon Hall we ran a drum circle this time in the middle of Barnsley town centre on the Mayday bank holiday. To be quite honest we were a little apprehensive about this one. The previous time I ran a workshop right in the middle of a main shopping centre I got turned away by security for making too much noise - the security were employed by the very people who booked me in the first place! As we set up the drums under a gazebo we saw some of the vendors in the shops looking at the drums warily and we wondered how long this drum circle was going to last. Fortunately the vendors were an amazingly tolerant lot and as the day continued and the weather got sunnier and warmer, the beats got better and better. People of all ages and abilities took part. The real highlight was in the afternoon. Some young enthusiastic teen age lads saw the drums and they were really up for having a laugh. They went for it and started banging grooves on the djembes. My guess is that these lads must have had some degree of street credibility because the next minute some teen age girls were taking part as well! In a matter of a few minutes the drum circle had a 'cool' status and we had 20 young people really going for it on the drums! Big thanks to James Brunt from the Barnsley City Council for hiring us for this event. James was a pleasure to work with and really took an interest in the session. James is also an artist and you can see some of his works here.